Costumes have been part of the fabric of humankind for centuries, and have long aided in our understanding of cultures and customs. While commonly worn for warmth or protection, they can also demonstrate status or rank. The design, material, and overall quality of garments provide insight into the manner in which the wearer lived, his or her socioeconomic position, or interests. In addition to studying surviving examples of clothing and accessories, costume historians also utilize a number of other sources of information about designs, fabric, and function. These sources include paintings, sketches, and printed works. Indeed, printed works on virtually any subject, be it science, engineering, or literature may serve as a primary source for research into costume history. Illustrations from sources like atlases, travel guides, and literary and scientific works can provide insight into dress spanning several centuries. Atlases such as Ortelius’s Theatrum orbis terrarum give a glimpse into fashions of the period, as illustrations of well-dressed explorers appear in doublets and hose. Laborers in diverse fields, ranging from mining to medicine, recognized the need for specialized clothing, as seen in Agricola’s De Re Metallica. Often protective in nature, clothing has been fabricated from diverse sources including animal hides, metal, and even ceramic. 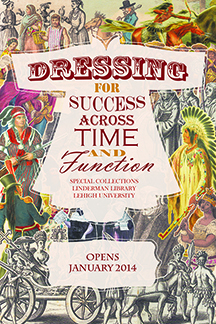 This digital exhibit features a selection of rare books, magazines, and photographs related to clothing and dress drawn from Lehigh’s Special Collections. We encourage visitors to look closely at the images to see what they might observe about how styles, materials, and functions of garments have changed over time.